Call For PapersUpdated list of English-specific or English-related Conferences open to Faculty and Students. MACRW program mentor Lee Maracle has won the $10,000 Harbourfront Festival Prize for contributions to literature. "Even in Toronto, my daughters are growing up being assessed according to the colour of their skin" Randy Boyagoda's Op-Ed in The Globe and Mail. Cruelty & Laughter: new book by Simon Dickie explores the vicious underside of eighteenth-century culture. 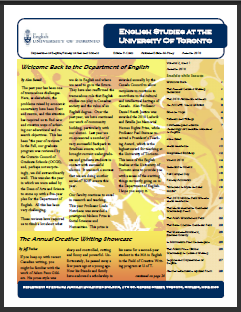 Read more about Cruelty & Laughter in FAS News (also posted through the U of T eBulletin under Research News). Read about Professor Greig Henderson's views on the connection between literature and the law in the November issue of Leaside Life! Anne Lancashire may be the first member of the Department since Marshall McLuhan to be listed in the Internet Movie Database (IMDb)! Check out her credit in a recently-released Star Wars documentary. You type her name into the search box, and up she pops, just like Harrison Ford or Alec Guinness. Congratulations to Nancy Kang on winning the Canada Research Chair in Women and Gender Studies. Karina Vernon's upcoming book The Black Prairie Archives: Anthology pulls together expressions of the Black experience in the Canadian Prairies. Daniel Scott Tysdal's poem received runner up Morton Poetry Prize. English graduate student Junran Yan receives Edwin S.H. Leong Scholarship. George E. Clarke comments on the recent performance of The Merchant of Venice at an Ontario private school in the CBC Radio: Metro Morning. Congratulations to English alumna Sarah Henstra on being awarded Governor General's fiction prize for The Red Word. Honouring Frankenstein's 200th anniversary: U of T scholars hold week-long celebration. Congratulations to Adrienne Todd on being awarded 2018-19 Toronto Arts Council Writer's grant. Grad students experience life on the farm for Professor Andrea Most's pastoral literature course. English professor Ian Lancashire turns to neuroscience to detect Alzheimer's disease by analyzing texts. "Randy Boyagoda's new novel is both deeply Catholic and Deeply funny" in The Walrus. Computer scientists in Australia teamed up with Adam Hammond to design an algorithm that writes poetry. Read "Industry Interview with Robert McGill" on Creative Writing in The Word on the Street. "U of T's Lost River" read about Professor Andrea Most's course Ecocriticism in the Faculty of Arts & Science News. Chris Kelleher on "An American in the Promised Land (of Canada)" in the University Affairs. "Ideas to Live by: A Conversation with Mari Ruti" by Tajja Isen and Philip Sayers in the Los Angeles Review of Books. "Is this Toronto?" Randy Boyagoda authors an op-ed in response to horrific Monday's van attack in the New York Times. Adam Hammond on "Why running a marathon is a terrible reason to travel" in The Globe and Mail. Daniel Scott Tysdal's poem "A MAD Fold-In Poem" in Poetry. "How a library card launched George Elliott Clarke's literary career" in CBC Atlantic. English has revised its Undergraduate curriculum. 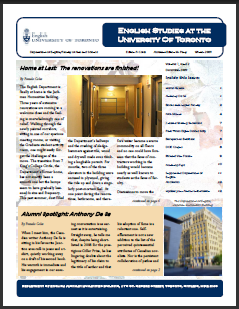 Learn about new requirements and student feedback in The Varsity. Toronto Star features Professor Karina Vernon's work in "In Praise of Black Voices"
Liza Blake's podcast on Early Modern Literature. Learning through literature at UTM. Learn more about Indigenous Literatures, a course taught by Daniela Janes, in The Medium. "George Elliot Clarke's modest proposal for a Ministry of Dreams" in NOW magazine. MA English alumna Avnee Paranjape, now a parliamentary intern, meets the Prime Minister. Read Mandy Pipher on consequences of devaluing a humanities degree in the Toronto Star. Professor Tom Keymer on 'How to be a great Journal Editor" in the Times Higher. Professor of English and St. Mike's College Principal Randy Boyagoda takes part in a panel on Canadian Culture in the CBC News: The Current Review (Part 1: Part 2). Ira Wells of English on Jordan Peterson's ideology in The Walrus. Read English PhD Candidate Mandy Pipher on "Louis C.K. 's dangerous and lazy conclusion that men are gross." in The Toronto Star. Globe and Mail editors and reviewers list of 100 Best Books of the Year features books by English, faculty, adjunct faculty and graduates. Congratulations to English alumna Erin Shields on her adaption of John Milton's Paradise Lost. Her play will premier at 2018 Stratford Festival. Professor Alex Hernandez invited Karen Millyard, a Toronto choreographer, to teach Jane Austen Dancing for his undergraduate course ENG323H1F - Austen and Her Contemporaries. Check out photo gallery and a short clip of the special lecture on our Facebook. Professor Randy Boyagoda explains the impact of Canadian literary awards. Read more in The Globe and Mail. English Professor Nick Mount captures Canada's literature boom in Arrival. Read more at Arts & Science News. Professor Andrea Charise discusses dangers of using the term "grey tsunami" for Canada's demographic shift on CBC's Sunday Edition with Michael Enright. We are delighted with the attention Professor Nick Mount's book Arrival: Story of CanLit is receiving in Canadian national media. Get tips from English graduate & instructor Elissa Gurman in Maclean's on creating University class schedule that won't destroy your soul.